25 December is just a few days away. It is the day of celebrations, the day of joy, and the day of receiving and giving gifts. However, it can also turn as the day of havoc if in the hurly-burly of merrymaking you forget to store things appropriately. Yes, storage on Christmas is as important as the Christmas tree. You wouldn’t want to spoil your Christmas evening spending time finding and managing things. Here are three Christmas storage hacks you cannot afford to miss. Jewelry are delicate items, which if stored in a clumsy manner can get damaged. Here is a simple solution. Get a plastic storage container and several plastic cups. Put each of your ornament in a separate cup. Store these cups in the container. In this way you can store several Jewelry items without causing slightest damage. You can even re-use same cardboard and cups every year. 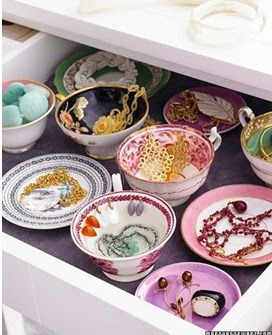 Or if you choose to add panache, store jewelry in vintage cups! 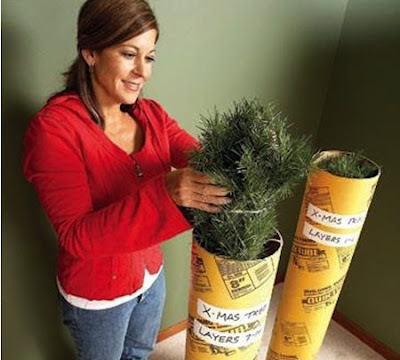 Artificial Christmas tree is difficult to store as it acquires lot of space. Here’s a great solution. Get two tubes, each having a diameter of 9 inches. Now wrap a string of yarn around each layer, shoving half of layers down the tube. Label the layers with numbers on every tube. Roll over these tubes in your garage rafters. A flawless and life-long storage solution for your Christmas tree. Last but not the least, are cardboard storage pools; easy to create and also easy to recycle! 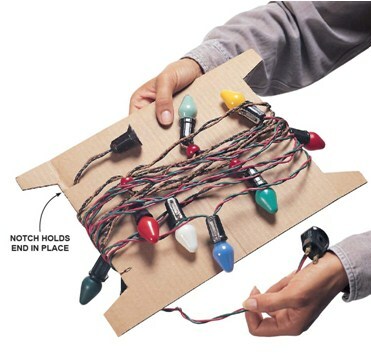 They keep the light strings unattached and therefore spruced up, ready to use. Just take a cardboard, cut the ends as shown and it is ready.